The first narrative history in English of the Italian front: a major forgotten conflict of the First World War. In May 1915, Italy declared war on the Habsburg Empire, hoping to seize its ‘lost’ territories of Trieste and Tyrol. The result was one of the most hopeless and senseless modern wars – and one that inspired great cruelty and destruction. Nearly three-quarters of a million Italians – and half as many Austro-Hungarian troops – were killed. Most of the deaths occurred on the bare grey hills north of Trieste, and in the snows of the Dolomite Alps. Outsiders who witnessed these battles were awestruck by the difficulty of attacking on such terrain. General Luigi Cadorna, most ruthless of all the Great War commanders, restored the Roman practice of ‘decimation’, executing random members of units that retreated or rebelled. Italy sank into chaos and, eventually, fascism. Its liberal traditions did not recover for a quarter of a century – some would say they have never recovered. Mark Thompson relates this nearly incredible saga with great skill and pathos. Much more than a history of terrible violence, the book tells the whole story of the war: the nationalist frenzy that led up to it, the decisions that shaped it, the poetry it inspired, its haunting landscapes and political intrigues; the personalities of its statesmen and generals; and also the experience of ordinary soldiers – among them some of modern Italy’s greatest writers. 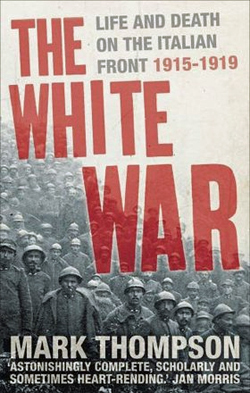 A work of epic scale, The White War does full justice to one of the most remarkable untold stories of the First World War.